“It’s obvious enough that fast fashion brands like H&M, Zara, and Topshop — as much as we often depend on them to fill out our wardrobes — have the power to cut a serious chunk out of the profits of traditionally untouchable luxury names. With cheaper (and often questionable) labor, massive support systems, and dependably profitable distribution networks, more budget-friendly retailers can seize market opportunities that high-fashion houses miss. But, of course, this isn’t new news — not to us, and not to the executives running those giants and struggling to maintain profitability without sacrificing status. Luxury brands are taking serious measures to keep up, as Suzy Menkes explores in this fascinating piece for T, and that means changing the fundamental innerworkings of the design process. Meaning, more shows and less lead time for designs, as well as an increased focus on resort collections, which, Menkes says, can account for up to three-quarters of annual profits. All told,some brands are aiming to put on around ten shows a year — the usual ready-to-wear collections, plus resort, couture, menswear, pre-fall, promotional shows, and often a few catered just towards extremely wealthy client bases in Asia, Dubai, Moscow, and Brazil. Of course, this takes its toll on the designers. Though there are probably a million reasons that went into the tragic suicide of Alexander McQueen, or the very-public breakdown of John Galliano, Menkes isn’t wrong to suppose that the increasingly stressful production cycle — which treats designers more like lab rats than vital individuals with endless creative license — played its part. There is less and less time for the things that often give way to the best collections: Wild and randomly-sourced inspiration and brainstorming, or just running with a crazy hunch. 2013 is off to a good start as some big names are addressing the climate revolution movement. 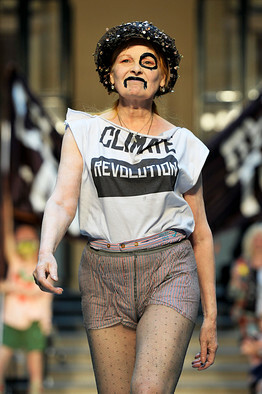 For example, designer Vivienne Westwood used her runway in Milan to promote a positive eco-friendly fashion message. Her models had puffed lips and painted black eyes, as though they had been physically fighting the battle. As the collection went on, slogans calling for an end to the climate crisis were printed on white T-shirts. “Climate revolution is the only means toward a sound economy. When the general public massively switches on to this fact we will win,” she said in her fashion notes, which accompanied her winter 2014 menswear collection previewed Sunday. What a great way to incorporate ethical fashion into classic design! In late October, will.i.am joined a host of celebrities who have launched eco-friendly fashion and lifestyle products. His brand, Ekocycle, is part of a worldwide initiative to encourage recycling. These products include eco-friendly Beats ByDre headphones. Will, like many other famous figures, hopes that his involvement in the eco-friendly movement will make recycling “cool” and appeal to younger generations. Green is the new black, as fashion designers worldwide continue to promote environment-friendly materials and socially responsible methods of production. See another article here: http://lifestyle.inquirer.net/73144/green-is-the-new-black.